A still from Frank Mitchell's film Unsung Heroes: The Music Of Jazz In New Haven. A jazz club is fighting the rising tide of gentrification before it even knows what it’s up against. Inside, patrons trickle in unaware. Strains of horn and piano filter through, unwittingly setting the soundtrack for a new chapter in forced migration. Outside, the neighborhood has started to gasp for air. But is it Detroit’s Black Bottom neighborhood circa 1949, or New Haven’s Dixwell Corridor just a few years later? Or somewhere else entirely, where the story is so familiar and so American we don’t even need the city’s name? 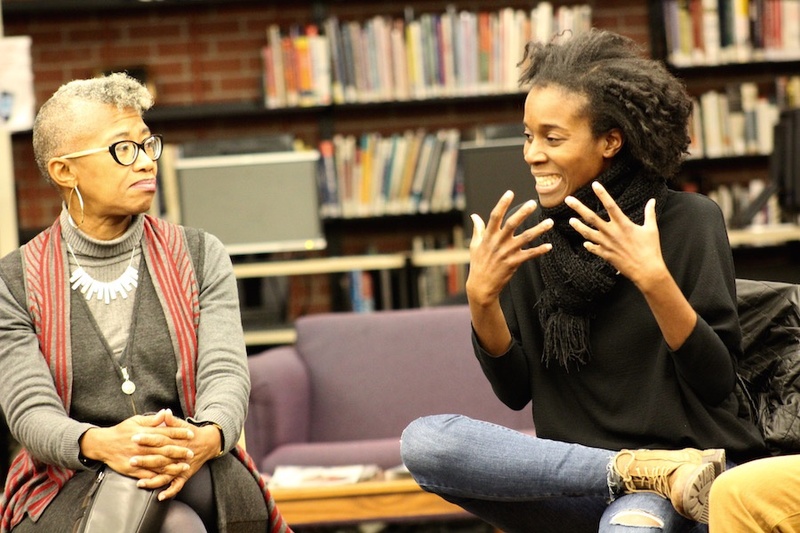 Last week, that question hit the Stetson Branch of the New Haven Free Public Library (NHFPL) as New Havener Ife Michelle Gardin and the cast of Long Wharf Theatre’s Paradise Blue spoke about the play, and its resonances in New Haven seven decades after it takes place. Close to 40 people attended the event. The play opens Wednesday Nov. 21 and runs through Dec. 16. Tickets and more information here. Ife Michelle Gardin and Paradise Blue Director Awoye Timpo. Lucy Gellman Photo. Written by MacArthur Genius Award winner Dominique Morisseau, Paradise Blue unfolds in Detroit’s now-demolished Black Bottom neighborhood and Paradise Valley entertainment district in 1949, just a year before the city government razed the entire area under the guise of urban renewal and the American Housing Act of 1949. In its once thriving Paradise Club, Blue (Stephen Tyrone Williams) can already hear the grim knock of gentrification at his door, scratching the brick and paint with something that sounds like sharp nails and eminent domain. Around him, Morisseau has built a universe that is as deeply human is it is historical. As Blue thinks about selling the club (Gardin described him as “the brother that’s in all kinds of conflict!”), we get a look into its life: club co-owner Pumpkin (Margaret Odette), musicians Corn (Leon Addison Brown) and P-Sam (Freddie Fulton), and a mysterious outsider named Silver (Carolyn Michelle Smith) who rolls into town like a rhythm no one’s ever heard before. Every breath they take is soaked in midcentury jazz, channeling a time when Duke Ellington, Charlie Parker, Billie Holiday, Charles Mingus and many others were still alive, touring and recording. And every breath is threatened by outside forces, waiting at the edges to dismantle the neighborhood. “This play finds characters at a real crossroads for all of them,” said Fulton. Leon Addison Brown and Freddie Fulton. Lucy Gellman Photo. 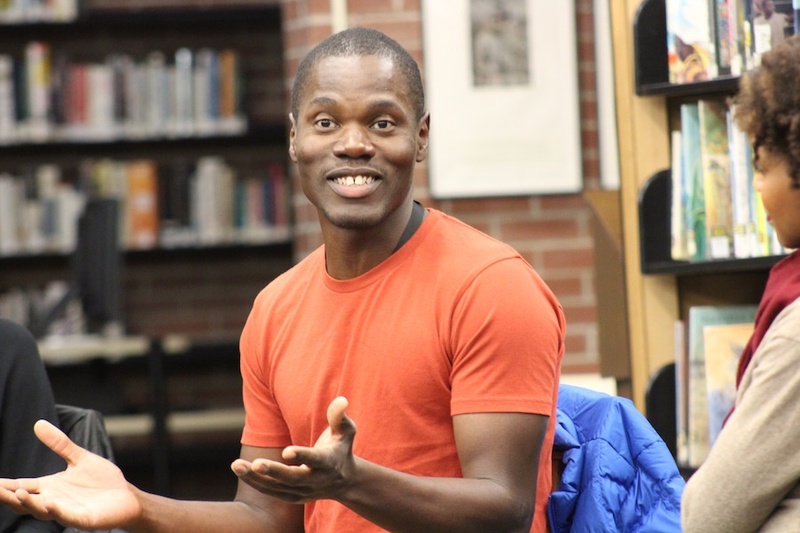 As the cast gathered at Stetson, Director Awoye Timpo spoke about the play’s baptism in music and history, the two inextricably linked in a story of displacement. A product of redlining, Black Bottom was built in the 1930s, as the city’s Black population boomed, but was largely excluded from other neighborhoods due to unfair housing practices. Black Bottom became, for decades, a model of Black self-sufficiency: hundreds of Black-owned businesses, social workers, doctors and dentists populated the neighborhood, with an entertainment district dedicated to their needs. According to Detroit historian Ken Coleman and records from the Detroit Urban League, the area once laid claim to 151 physicians, 140 social workers, 85 lawyers, 71 beauty shops, 57 restaurants, 36 dentists, 30 drug stores, 25 barber shops, 25 dress makers and shops, 20 hotels, 15 fish and poultry markets, ten hospitals, ten electricians, nine insurance companies, seven building contractors, five flower shops, two bondsmen and two dairy distributors. Hundreds of photos from before Black Bottom's destruction still live in the Burton Collection at the Detroit Public Library. And then it was gone. After the passage of the American Housing Act of 1949, the City of Detroit seized and razed the area, claiming “slum clearance” and using the land to make room for the Chrysler Freeway (I-75), sprawling Detroit Medical Center, and now-historic Lafayette Park neighborhood, where apartments designed by Mies van der Rohe now sell for a small fortune. Almost no traces of the area's history remain. While big venues like the Paradise Theatre ultimately saw a resurrection (it is now Orchestra Hall, where the Detroit Symphony Orchestra plays its shows), most of the area’s jazz clubs were crippled in their tracks, names wiped from the historical record. And in the intervening decades, Southeastern Michigan has become one of the most segregated areas in the country. And the history of displacement keeps telling the same story. As a new wave of gentrification has swept over the city in recent years, Detroit’s The Downtown Development Authority has put $52.4 million back into the area—to build a 24-hour entertainment district poised to house just one tenth of the people it did over half a century ago. Stephen Tyrone Williams: from a discussion about Coltrane's A Love Supreme to his character's own theme. And not just in Detroit but in New Haven, where the Dixwell Avenue Corridor was the city’s own Paradise Valley. While Unsung Heroes: The Music of Jazz in New Haven notes that New Haven only had about 3,000 Black families at the turn of the 20th century, that number soon grew with the promise of employment. Like Detroit’s auto industry, the Winchester Repeating Arms Factory had the city booming, keeping whole neighborhoods in business as it churned out military-grade equipment in one hand, and signed paychecks with the other. 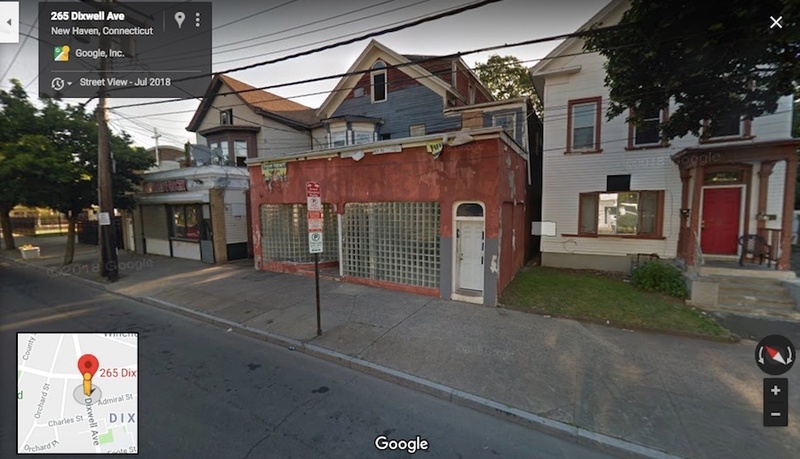 She recalled what it was like to walk down Dixwell Avenue, and have a whole world of Black-owned businesses at one’s fingertips, stretching from one end of the avenue all the way to the other. While grocers, doctors and dentists built a thriving economic ecosystem, music pulsed at spots like The Monterey and Dinkie’s Jazz Club. Now, the Monterey stands empty at 265 Dixwell, across from the Dixwell Ave Mini Mart and Flowers By Design. 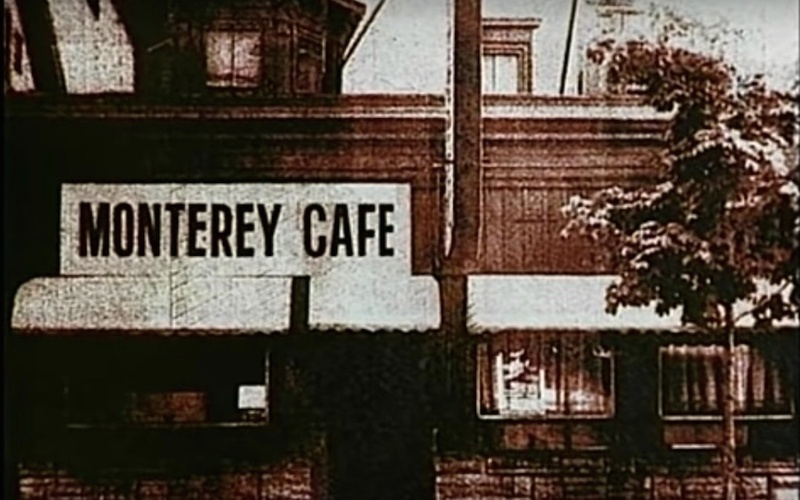 What now exists of the Monterey. Google Maps. As the play lands in New Haven—it was performed at New York’s Signature Theatre to great acclaim earlier this year—Long Wharf has sought to recreate many of those memories. 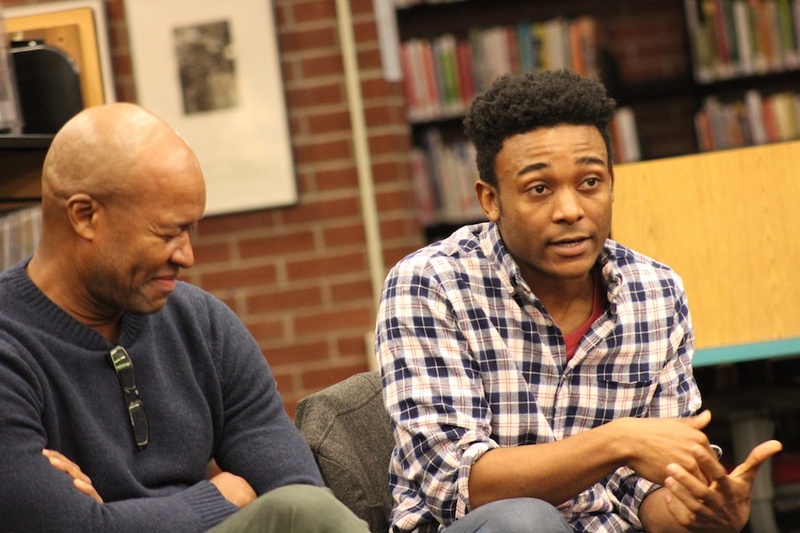 While Timpo said she considers Signature Theatre Director Ruben Santiago-Hudson a mentor, she was quick to add that this production is, in many ways, uniquely Long Wharf’s. Working from scratch, jazz trumpeter Alfonso Horne has devised music not only for the club’s performances, but for each of the characters who inhabit the space. Several weeks ago, he came in during a cast read-through of the script, speaking with cast members when he wasn’t listening to the words. Smith, who plays Silver, said that his presence helped her forge a connection with not just the material, but with the time period itself. Williams, who plays Blue, recalled telling Horne about a specific scene in John Scheinfeld’s Chasing Trane, in which the guitarist Santana says he plays John Coltrane’s A Love Supreme and burns sage each time he gets to a new hotel room. Horne took the chord structure from parts of the 1964 album and turned it into Blue’s theme, which follows the character each time he exits and enters the stage. Carolyn Michelle Smith, who plays Silver. Lucy Gellman Photo. Fulton, who plays P-Sam, jumped in. For the characters in this work, mastery of the music is just as important as every other aspect of the show, because the actors want to honor “the ancestors”—the jazz greats who have come before them, and graced Paradise-like venues across the country. When crafting Paradise Blue’s world, Timpo looked critically to two other works that comprise Morisseau’s Detroit Trilogy: Detroit ’67 and Skeleton Crew, the first of which Collective Consciousness Theatre (CCT) performed in 2014. 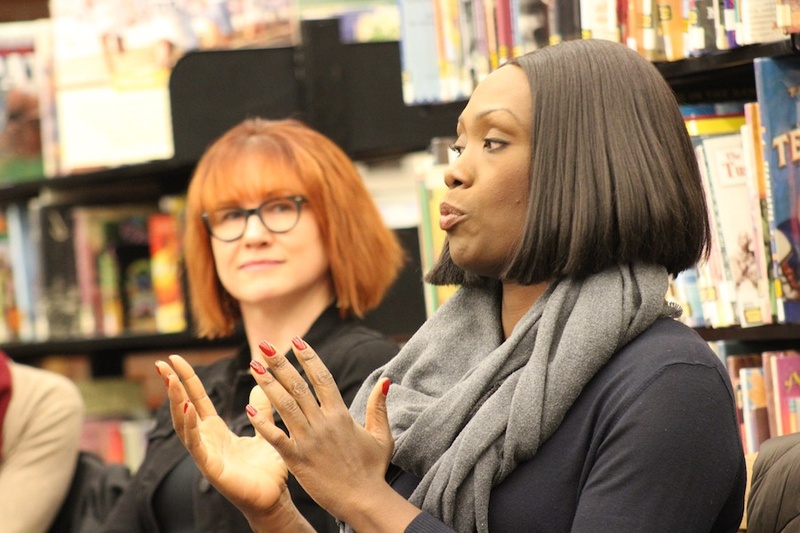 She praised the works’ timeliness, drawing a parallel with August Wilson’s heralded American Century Cycle, which memorialize 100 years of Black life in 20th century Pittsburgh. From those works, she said, she was overwhelmed by the sense that history keeps repeating itself, creating and recreating systems of trauma and displacement for people of color. As a lifelong New Havener, she said that she’s watched Yale University snap up real estate at an almost unprecedented rate, making New Haven less livable for the people who have called it home for generations. While she did not mention them by name, the insatiable appetites of local mega-landlords Mandy Management, Pike International, and Ocean Management pulsed at the edges of the room. She described a national Facebook group called “Buy The Block,” dedicated to fighting gentrification by pooling community resources, and reinvesting in real estate in historically Black neighborhoods. She suggested that if enough community members pitched in, a group could buy back The Monterey, and surrounding properties. “In small ways, that is what we will have to do to turn this tide of gentrification,” she said. Dominique Morisseau's Paradise Blue runs at Long Wharf Theatre from Nov. 21 to Dec. 16. For tickets and more info about the play, visit the theater's website. To listen to Babz Rawls-Ivy interview the cast on WNHH Community Radio, click or download the audio above.